Disparate acts gracefully knitted together create a lovely distraction. The outfits evoke a Bedazzler-run-amok in Siegfried and Roy’s costume shop. The lighting is pure glitter gulch. And the acts? Picture Liberace’s long-lost Shanghai-born twin falling into a giant sloshing bucket of Cirque de Soleil and emerging with a show for audiences more accustomed to Vegas-style MTV smash cuts than the studied elegance of those artsy-fartsy French Canadians. This is the wonderful world of Cirque Shanghai: Bright Spirit (buy tickets here), running in the Armadillo – whoops, the Skyline Stage – on Navy Pier through September 7th. The 90-minute production is a variety show on steroids – but if steroids were a good thing. Which is to say, Bright Spirit is a hopped up, mega-amplified celebration of some of the most garishly useless and entertaining skills around: Hoop divers, plate spinners, chair climbers (! ), hat jugglers (!!) and unitard-clad creatures in inner tubes bouncing and rolling in ways that seem to defy more than a few fundamental laws of physics. For summer time guilty pleasures, Bright Spirit is up there with State Fair Fried Twinkies and snickering Oak Street beach’s endless preening spandex parade. Directed by Naperville-native Dwight Jordan and choreographed by Lincolnshire native Brenda Didier, Bright Spirit – like all the Cirque Shanghai productions – is the brain child of Mike Wilson. The son of travelling magicians, Wilson followed his parents throughout China as a child, picking up a lifelong fascination with Chinese acrobatics, dance and folklore along the way. In 1990, he started bringing Chinese performers to the U.S., envisioning a sort of cross-cultural pollination between traditional Chinese art forms and high-tech Western production values. 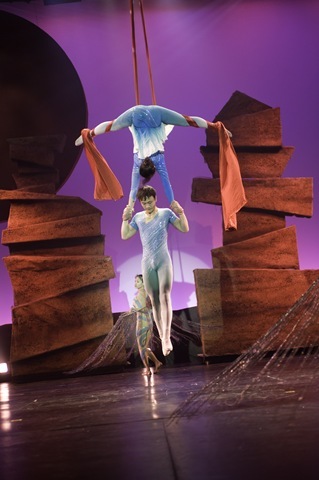 Almost 20 years later, Cirque Shanghai is the elaborate culmination of that vision. And in Navy Pier – a venue where one can find just about everything but beat baiting (though there’s lots of cotton candy for just such a purpose) – Wilson has a venue that perfectly complements Cirque Shanghai’s hybrid of populist thrill-o-rama stunts and ancient Eastern art forms. 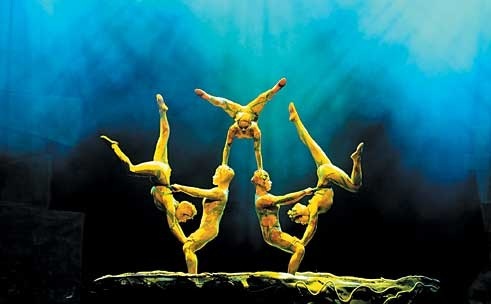 Now in its fourth season on the Pier, Cirque Shanghai has been polished and tweaked since it initially arrived, but the core showstoppers remain intact, a splendid display of spectacularly worthless skills resplendently presented. Plate spinners turn the stage into a dizzying, dazzling pond filled with hundreds of rapidly orbiting lily pads set twirling by elite-level gymnasts. In an inexplicable (yet laugh-out-loud amusing) non-sequitor of sorts, a giant day-glo caterpillar that looks for all the world like an outtake from “James and the Giant Peach” makes his undulating way across the stage toward the dinnerware finale. Also nifty: The Russian barre, wherein acrobats make the likes of Nastia Luikin look like a piker as they flip and whirl on a balance beam that seems to be made out of a giant foam noodle. We’ve long fancied ourselves a connoisseur of contortionists, and the seemingly boneless wonders here do not disappoint offering a gallery of body positions that, when one stops to think about it, are simply not possible. With such disparate acts gracefully knitted together by Didier’s apt choreography, Bright Spirit is a lovely distraction. Save the Serious Art for fall. Now is the summer of our deep content with the likes of plate spinners. See the entire Cirque Shanghai photo album here. 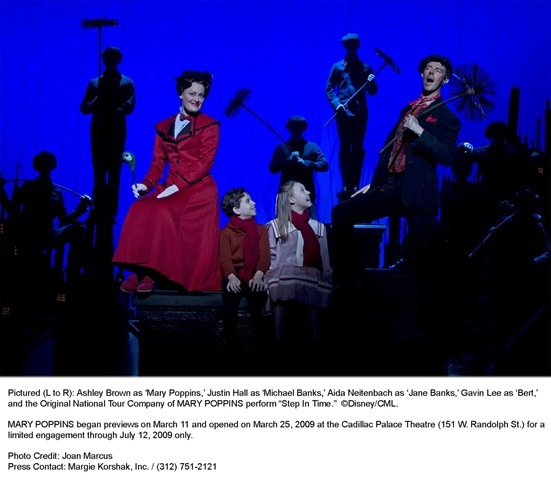 Excited doesn’t begin to describe the audience for the opening of the long-awaited “Mary Poppins” national tour Wednesday at the Cadillac Palace Theatre. Exhilarated is more like it. Smart children know parents have to be trained to behave. 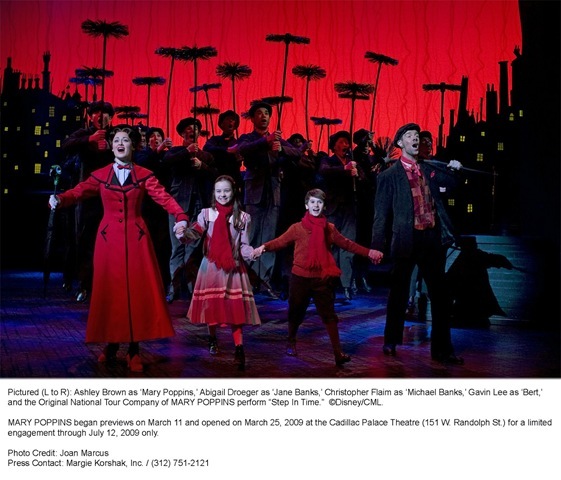 Savvy, pint-sized domestic reformers will be thrilled with “Mary Poppins,” a rare family musical that spends most of its ample running time exhorting parents to stop working, take care of their long-suffering spouses, discover their inner supercalifragilisticexpialidocious and go fly a kite with the kids. 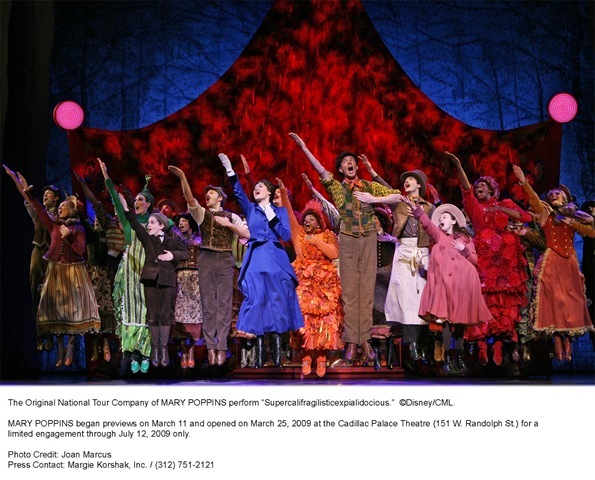 “Mary Poppins” audience as lucky as lucky can be in nanny’s magical hands.